Friday, November 20, 2015 Defiant Whisky concludes our Destination Dinning series with The Chestnut, located in downtown Asheville creating handcrafted menus featuring local ingredients. Start your evening at Camp Golden Vally on the wraparound porch, sipping beverages and taking in the breathtaking views of the South Mountain backdrop. Then join us at the dinner table near a wood-burning stone fireplace and relish in a Defiant infused 4-course menu created by Chef Joe Scully. Click HERE to view and download the Nov. 13th dinner menu. Table reservations are $69.95 per person, 21-years old and older, and include passed hors d’oeuvres, starter course, main entree and dessert, plus complimentary whisky tastings! Chestnut features world class entrées, in a warm and inviting atmosphere served by friendly and gracious hosts. The Chestnut is in walking distance of many popular downtown attractions in Asheville and can be found across the street from the Aloft Hotel. Visit their website to view menus, events and more! 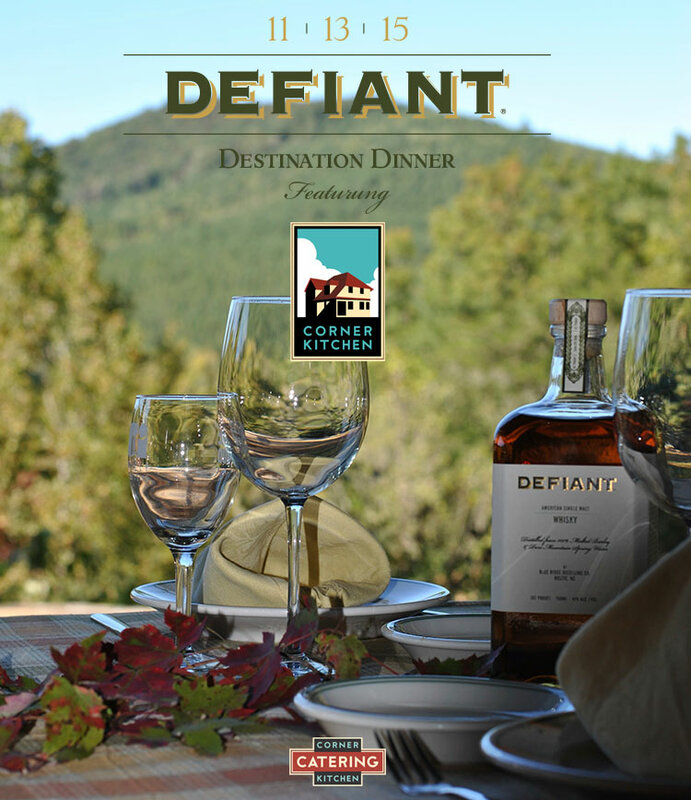 Friday, November 13, 2015 at Camp Golden Valley, Defiant Whisky continues our Destination Dinning series with Corner Kitchen, an upscale, charming restaurant nestled in the Biltmore Village of Asheville, NC. Start your evening on the wraparound porch, sipping beverages and taking in the breathtaking views of the South Mountain backdrop. Then join us at the dinner table near a wood-burning stone fireplace and relish in a Defiant infused 4-course menu created by Chef Josh Weeks. Corner Kitchen brings you an experience like no other. The restaurant sits inside of the two-story Historic Biltmore House in the downtown Biltmore Village. The beauty and warmth of this century old home provides a family room, bar, and outdoor patio dining along with private party rooms which were once visited by President Obama and the First Lady. Corner Kitchen is open for breakfast and lunch Mon.-Fr. and dinner every night of the week. Brunch is served on Saturdays and Sundays. For more information visit The Corner Kitchen website. Defiant Whisky is taking its spirit to the Lowcountry! Grab your tickets to Savannah Food & Wine Festival and taste a sip at the River Street Stroll on November 13th from 5:30-7:30 PM. Try our American Single Malt while overlooking the dazzling Savannah River. Then on Saturday, November 14th take your souvenir glass around the Georgia State Railroad Museum for unlimited tastings of hundreds of wine, spirits and beers. Visit our Defiant Whisky booth for a tasting and meet our team. Event is open from 1-5 PM. Award winning Defiant Whisky is bringing its high spirits down to the Lowcountry for the Savannah Food & Wine Festival and to kick off the weekend, they’re holding a whisky tasting at Pacci Italian Kitchen + Bar on November 12! Enjoy signature Defiant cocktails by Pacci bartender Jha Clarke and an assortment of complementary Italian dishes using meats smoked over American white oak spirals, the same ones used to make Defiant Whisky! Come in for dinner and check out the special drink menu while Defiant pours tastings and raffles off merchandise from 5pm-8pm. ***For more details, catch Defiant on WTOC Mid-Morning Live on Nov. 10 at 10am! Award-winning Defiant Whisky has already started a revolution in the whisky world, and now they are ushering in a new wave of dining. 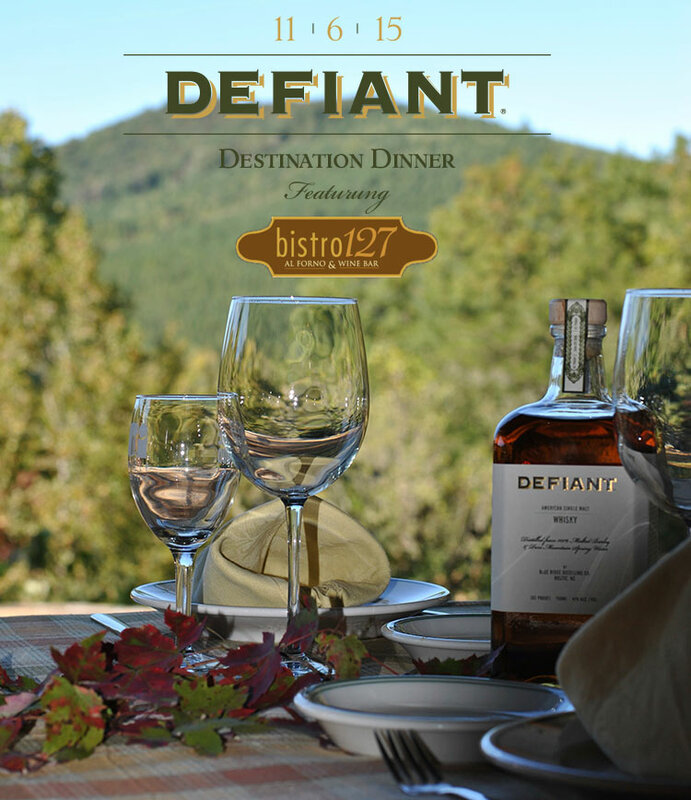 The makers of Defiant Whisky are launching a “Destination Dining” event series, exquisite and festive evenings overlooking North Carolina’s beautiful South Mountains. Each Friday beginning on October 23 through November 20, friends and loved ones can reserve a table at their newest event venue, Camp Golden Valley, to enjoy a gourmet 4-course meal and whisky tastings. Table reservations are $69.95 per person, 21-years old and older, and include passed hors d’oeuvres, starter course, main entree and dessert. Plus complimentary whisky tastings! Or call 828-245-2041 / 828-286-9977 to make a reservation over the phone. The makers of Defiant Whisky will host a tasting booth at WhiskyFest™ 2015, the longest-running and best-attended whisky festival in the U.S., offering you the opportunity to taste award winning Defiant Whisky and a wide selection of more than 300 whiskies from around the world at the Marriott Marquee, San Francisco. Attend free seminars conducted by whisky experts and enjoy the never-ending gourmet buffet. We want your WhiskyFest experience to be a memorable one. Your ticket includes access to the grand tasting, all seminars (on a first come first serve basis), a commemorative Glencairn crystal nosing glass, gift bag, program booklet and pen. The 1st Annual Whisky Jewbilee in Chicago, IL is a Kosher catered premium whisky event focused on fine spirits and cigars. This is your chance to taste Defiant Whisky and sample approximately 250 of the world’s finest whiskies plus enjoy some premium kosher barbecue — bring your own cigars to smoke in the open air courtyard. Get your tickets today by visiting WhiskyJewbilleeChicago and join the whisky revolution!